Tribe of Quivira - Started in 1923, It still exists in the Quivira Council, Kansas. The OA also operates with it and they have a mutual piece of regalia that both organizations are part of. It is called the Scout Coup Thong. It takes five years to complete the five ranks of the Tribe. First year is Tracker, second year is Hunter, third year is Brave, fourth year is Warrior and fifth year is Old Warrior. 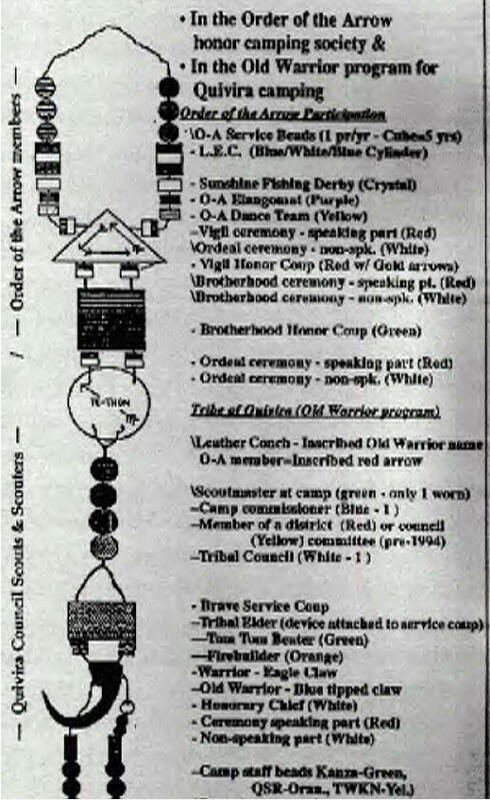 In addition to the many different activity areas, elective Scouting programs and adventure opportunities offered at Camp Kanza and Quivera Scout Ranch (and formerly Camp Ta-Wo-Ko-Ni, closed in 1993), Scouts and leaders may participate in the Tribe of Quivira, commonly known as the "Old Warrior" program. Scouts receive a program orientation during their camp week in preparation for special tribal, ceremonial activities. FIRST-YEAR CAMPER - During the week, first-year participants will "protect the camp" by keeping it free from litter. The first-year camper program begins Friday, after breakfast. Each person will bring the following: paper, pencil, ground cloth, and a Scout Handbook. They will be placed "on silence" during the morning's program and evening ceremony. They are given the program guide-lines, and the Story of Hiawatha, as told by Longfellow. At the campfire, they will be blindfolded and given the “black drink” (actually a harmless concoction, but with a week’s build-up...... A coup thong is given at the Friday campfire and they are named "hunters." SECOND-YEAR CAMPER - During camp week -- but before Friday morning, hunters will "preserve the camp" by completing a service project. The second-year camper program begins after Friday breakfast and lasts about one hour. Campers will then be summoned to the meeting point by drum and led to a ceremony. They should bring a designated log with their initials and troop no. carved in it. Scouts are then released to afternoon activities. At the Friday evening ceremony, a yellow service block is given for the coup thong, and they will be named "braves." THIRD-YEAR CAMPER - During the week, third-year, braves, will select a rock weighing over 15 pounds and chisel their initials in it. On Friday, they will rise early and carry their rock for the entire day. (Exception: a physicians release or a physically challenged condition. ) The purpose of carrying this symbolic burden is to remind a Scout of the burden of responsibilities he must carry throughout his life. A black "Eagle" Claw, for the coup-thong, and a personal Indian name are given at the closing campfire, and these campers are called "warriors." When I did this in the early 1960’s, you had to have the rock carved early in the week (something like Wed) and then you carried it all the rest of the week. Needless to say, I worked really hard on aquatic MBs and the Mile Swim that week. FOURTH-YEAR CAMPER - During the week, the warrior must assist in tribal activities. On Friday, they assist in one of the first, second, or third year programs. They will also be responsible for building and tending of the fire for Friday nights closing campfire. Fourth-year campers participating in a portion of the tribal program at the campfire will be named an "old warrior," and be allowed to paint the tip of their claw, light blue. FIFTH-YEAR CAMPER -Fifth-year campers/old warriors are encouraged to help with the tribal program, throughout their camp week. They will also sit on the review committee for all new Indian names that are given. Friday evening, fifth-year participants will be presented an Indian head to be attached to their service block, and they will be named "tribal elders." Tribal Elders are afforded the highest respect at all ceremonial campfires. TRIBAL COUNCIL. The Tribal Council oversees the activities of the Tribe of Quivira. Members of the Tribal Council are appointed by the Quivira Council Camping Committee, upon the recommendation of district camping chair-persons. They are recognized with a white coup on the coup-thong. tom-tom beaters -- green coup. Details of the Tribe of Quivira program are contained in a booklet available at summer Camp.